Addi loves to help out around the house. Seriously - no matter what chore I am doing, she wants to participate, which I love. Obviously, doing dishes, laundry, pooper-scooping, whatever, it all takes longer with her help, but it's time we can spend together so it's worth it. That said, the one chore I don't want her help with is vacuuming. And she constantly wants to help me with it - she even gets the vacuum out on her own and wants to use it. Because the Dyson is too heavy for her, we found a plastic purple toy one for her to use. Of course she still wants to use the real one, so we continued to fight with her over it. Until last week! While deciding what to get rid of in our garage sale, we came across this Eureka handvac thingy we got as a wedding present and haven't really used in the last few years. Jay suggested trying it in the kitchen (with dog hair, we can't really use a broom) and it worked like a charm! Then I hit the cleaning jackpot.... I took the longer handle off of it, showed Addi how to use it, and off she went. Fifteen minutes later the kitchen was mostly dog-hair free. Angels sang from heaven above. 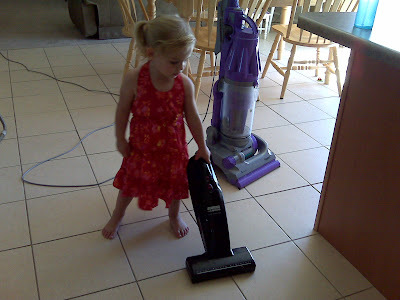 Addi was thrilled to have a real vacuum. I was thrilled because she was happy and (quite frankly) she did a decent job. Jay came home and Addi was super proud of her handiwork, so we got it out to show him the exciting development in house cleaning. And the stupid thing didn't work AT ALL. Go figure.